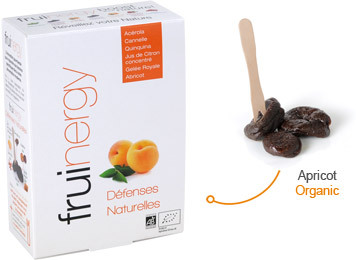 fruinergy Natural Immunity combines apricot with a tasty association of lemon juice, royal jelly and plants traditionally used to reinforce the organism immune system: Acerola (Malpighia), Cinnamon (Cinnmomum zeylanium) and Cinchona (Cinchona pubescens). fruinergy Natural Immunity is rich in copper and a source of Vitamin C. Combined to the plants mixture; these nutrients contribute to the normal functioning and the natural reinforcing of natural defenses. fruinergy Natural Immunity is made with environmentally friendly techniques. Its carefully selected ingredients add up to a high quality product with authentic taste.